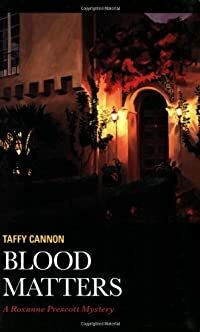 Blood Matters by Taffy Cannon, a Mysterious Review. Review: After a nearly 7 year absence, Taffy Cannon brings back Roxanne Prescott in Blood Matters, the second mystery in this series featuring the San Diego homicide detective. The wealthy community of Rancho Santa Fe is known for its horse ranches, orchards, and massive homes. It isn't known for murder, and when one of its residents is brutally killed, the San Diego Sheriff's Department is assigned to the case. Sam Brennan, a self-made millionaire, was the founder of Adoption Central, an organization that not only arranged adoptions but reunited birth parents and their children, was found beaten to death. As Roxanne and her team probe his murder, they uncover an unusual fact: Sam Brennan was dying of cancer and had only a few months to live. Why would someone risk killing Sam when he had so little time left? There are no shortage of suspects, from ex-wives and current lovers to business associates and clients. Cannon deftly handles all these characters well giving each a potential motive for wanting Sam dead then providing them with alibis for the time of the murder. An inveterate collector of the sometimes arcane and obscure, Sam's home was filled with objet d'art that the author cleverly uses as clues that eventually point to the killer. Towards the end of the book, Roxanne summarizes all the suspects on a whiteboard for review. With so many characters, it's unrealistic to expect readers to remember each and every one. Yet with this simple act, so rarely practiced by today's mystery authors, Cannon allows readers to participate in the denouement instead of just following along. After such a terrific setup and delivery, the identity of the killer is a bit of a disappointment if only because it is, ironically, so predictable (alibi notwithstanding). This objection, however, is a relatively minor point in an otherwise outstanding mystery. Acknowledgment: Perseverance Press provided a copy of Blood Matters for this review.